The mini cord lock functions by depressing the spring until the ¼ inch holes line up. forming a loop that is adjustable by moving the cord lock. 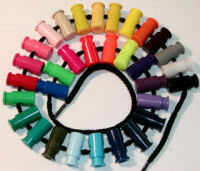 Buy one of our mini cord locks. 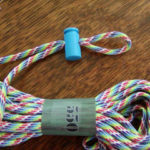 Oregon cord lock has mini cord locks for sale. Perfect for apparel and shoelaces. The mini cord lock is injection molded from a high strength Acetal thermoplastic. It has approximately a 7/16 inch (11 mm) diameter. 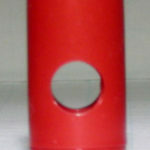 It is 1 inch ( 25 mm ) long (non compressed) with a ¼ inch ( 6 mm) hole. Please check out our color page. Actual colors may vary slightly, for an exact match, call for a sample. Unfortunately samples are not free as the mail costs more than the parts. Please call or e-mail and we will help develop a sample pack that works for you! A sample pack is typically 3 minis and 3 maxis in 6 colors for $7.00 includes 1st class mail. Buy mini cord locks. Oregon cord lock has mini cord locks (1″) for sale. Perfect for apparel and shoelace. For larger orders, please contact us for pricing and availability. Mixed Color Product packaging is available ! FOB our plant. Prices shown are for any stock single color quantities.